In his memoir, the Germania Musical Society's Henry Albrecht painted an interesting picture of the ensemble's relationship to Newport during the "hotel period," stating: "the magical effect of the sounds of the orchestra aroused not very solemn thoughts in the breasts of art-loving ladies, affections more than on the level of Platonic friendship." He added that their concerts "brought to the fore the reality of the words that 'Music is the language of the heart.'" Such memories included pleasurable and cozy evenings at the Ocean House. When the original Ocean House opened on Bellevue and East Bowery in 1844, it instantly rivaled the most luxurious European hotels. The Ocean House offered summer visitors topnotch accommodations, fine-dining, and a variety of attractions. A Newport Mercury article in 1884 reminisced about "Old Time Newport" highlighting the new Ocean House and the hundreds of people assembling daily and nightly to the music of the "celebrated Germania Band." Although the original Ocean House burned down one year after its opening, a larger and grander replacement was ready for the summer season of 1846 to host masquerade balls, cotillions, and Saturday night dances known as "hops." At the time, fashionable dances like the polka, redowa, and cotillion were all the rage: "morning noon and night the whirl went on." In 1850, following their very successful first summer in Newport, the Germania helped close out the season with a "Fancy Ball" at the Ocean House. The Germania opened the ball with a late-evening march, dinner was served at midnight, and dancing continued through sunrise the next morning. Germania conductor Carl Bergmann's composition "Fancy Ball Polka Redowa" was published the following year. The mazurka-like redowa, featuring a Czech dance rhythm, was new to the States at that time. To be sure, the scene at the Ocean House on dance nights was effervescent as mellifluous music drifted through the hotel's alcoves and corridors while guests promenaded around the grounds with glee. Despite a number of other hotels opening in Newport over the following two decades, the highest praise was usually reserved for John G. Weaver's Ocean House. Summer visitors considered it the embodiment of the elegance, beauty, and style of American summer society. 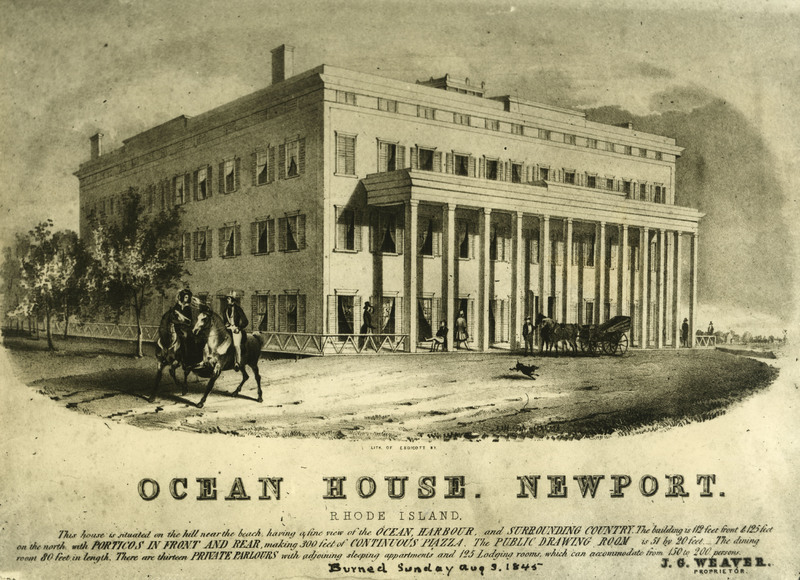 Lithograph of the Original Ocean House Hotel: Opened in 1844, the Ocean House hotel quickly became one of the most well-known and frequented establishments in Newport. The first Ocean House presented lodgings and services unlike any Newport had ever known before, offering accommodating open-air features with modernized luxuries and easy access to fresh ocean breezes. 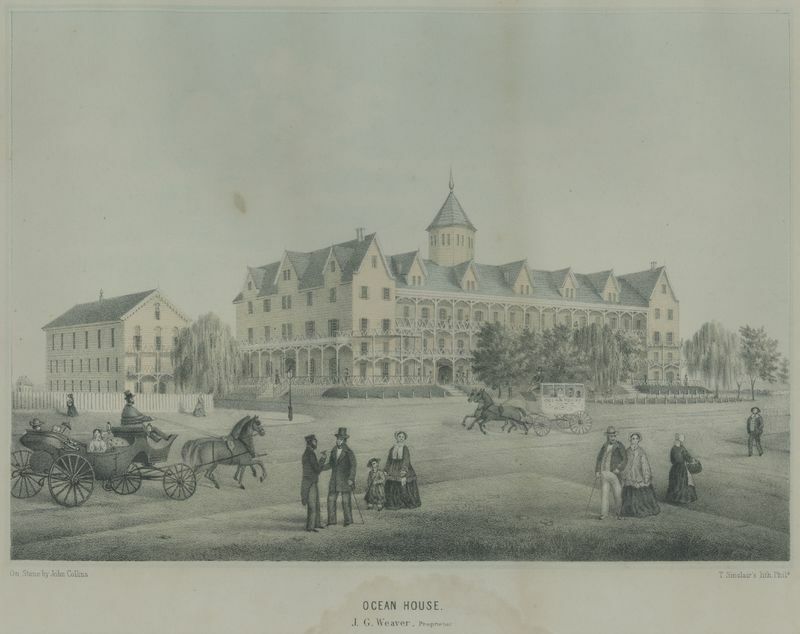 Colored Engraving of the Second Ocean House Hotel: After the first Ocean House was destroyed by a devastating fire in August of 1845, the second, and even more grandiose, version was built in a Gothic Revival style. Its elegant design, numerous accommodations, and sheer size allowed it to surpass its former glory and quickly became known as the most stylish hotel in Newport. 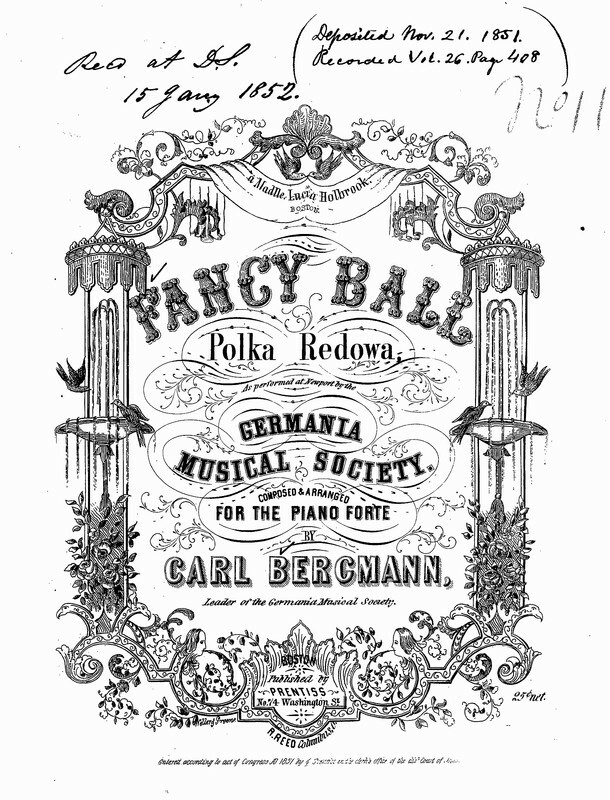 "Fancy Ball Polka Redowa" Title Page: The "Fancy Ball Polka Redowa" was composed by Germania conductor Carl Bergmann. The Redowa was published in 1851 by Prentiss of Boston, MA, a year after the Germania performed at the Ocean House's own "Fancy Ball." Many of the dance compositions that the Germania Musical Society performed were also written by the members themselves. In 1856, Germania conductor Carl Bergmann published a series of 4 works entitled The Season in Newport, which included tributes to all the major hotels, including a piece aptly titled "Ocean House Polka." Starting in the 1840s, a new category of group dancing emerged called "cotillion," where a series of party game steps were led by a conductor or leader with a prescribed set of rules. It was usually performed to waltz music and would have been one of the more popular forms of dancing at the hotels during this time-period. You can see an example performance here, created authentically by Dancetime Publications. Brian Knoth, PhD, “The Ocean House Hotel,” Rhode Tour, accessed April 21, 2019, http://rhodetour.org/items/show/336.